If you're a fan of relaxed dressing when it comes to fashion, you'll love this seriously chic pairing of a grey boucle open cardigan and a gold watch. When it comes to shoes, this look is complemented well with black leather high top sneakers. If you're all about relaxed dressing when it comes to fashion, you'll love this seriously stylish combo of a mustard shirtdress and a gold watch. Spruce up this ensemble with black leather ankle boots. Reach for a burgundy puffer coat and a Cartier ballon bleu de 36mm 18 karat gold stainless and diamond watch to be both killer and relaxed. Make burgundy leather pumps your footwear choice to take things up a notch. 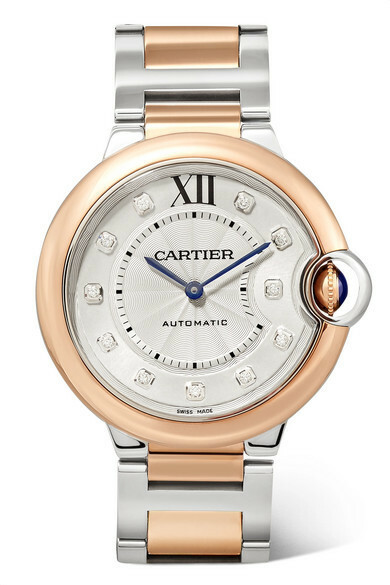 If you're a fan of relaxed dressing when it comes to fashion, you'll love this extra cute combination of a red and navy gingham dress shirt and a Cartier ballon bleu de 36mm 18 karat gold stainless and diamond watch. White low top sneakers work wonderfully well here. 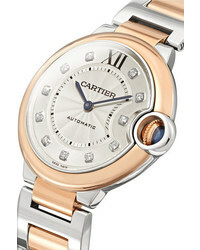 If you're a fan of relaxed dressing when it comes to your personal style, you'll love this incredibly chic combo of a beige blazer and a Cartier ballon bleu de 36mm 18 karat gold stainless and diamond watch. Amp up the cool of your ensemble by wearing brown leather mules. 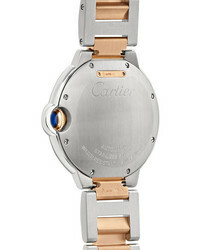 If you're all about comfort dressing when it comes to fashion, you'll love this super cute pairing of a red and navy check dress shirt and a Cartier ballon bleu de 36mm 18 karat gold stainless and diamond watch from NET-A-PORTER.COM. When it comes to footwear, this outfit is complemented really well with silver leather flat sandals. Team a charcoal turtleneck with a gold watch for a casual coffee run. If you're all about functionality dressing when it comes to your personal style, you'll love this uber cute pairing of a black oversized sweater and a gold watch. Complete this look with tan leopard high top sneakers. If you want to look cool and remain cosy, wear a mint long sleeve t-shirt and a Cartier ballon bleu de 36mm 18 karat gold stainless and diamond watch. Got bored with this outfit? Enter tan studded leather lace-up ankle boots to shake things up.